All of the artwork is done, and the rough draft is written! Now it just needs to get funded! 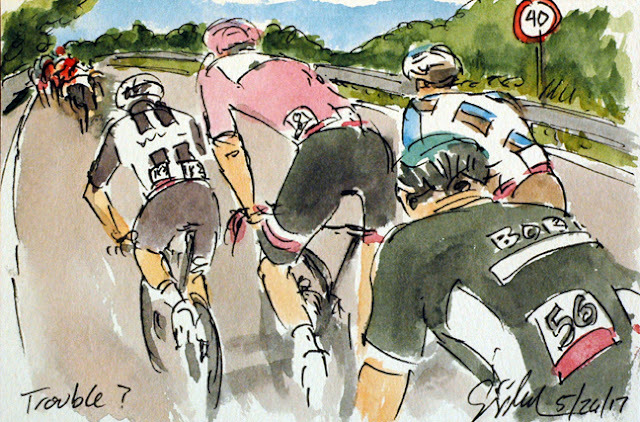 There are only 5 days left to back this project and be a very important part of making Art of Cycling: The 100th Giro d'Italia happen. There are 156 paintings create live as the race unfolded each day as the peloton wound its way around the islands, coasts, farmlands and mountains of Italy. There are at least 4 paintings and as many as 27 of each of the 22 teams that formed the Gruppo. There are at least one painting of 114 of the 197 riders who started the 100th Grio d'Italia. So if you haven't done it yet, please go to kickstarter and back the project. There are great rewards that start at just $1.00 and shipping is available anywhere in the world! Everyone who backs the project regardless of amount will have there name in print in the front of the book. So don't delay, if this is going to happen, it has to be fully funded by June 5th at 11:59 pm EST. Thank you to all who have backed the effort, and to all of you who are about to. 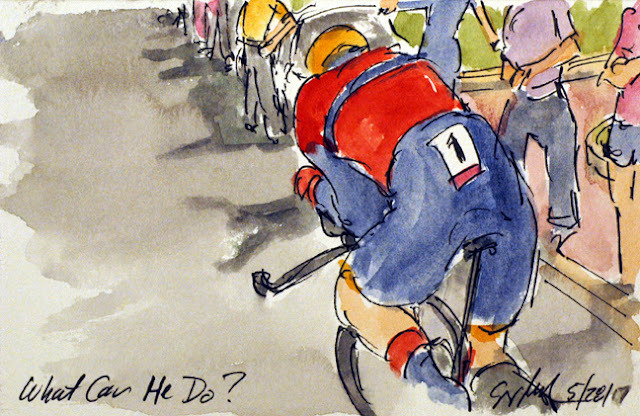 Giro, Final Stage: What Can He Do? "What can he do?" must have been the question on every Italian cycling fans all along the time trial course. Vincenzo Nibali (Bahrain-Merida), has ridden a brilliant race but has just come up a few seconds short. 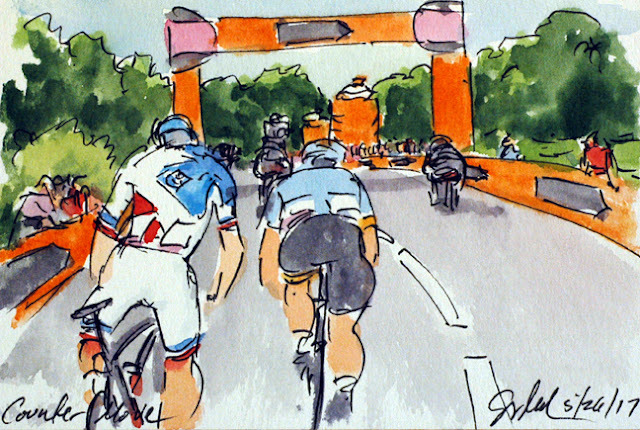 In fact he is only holding off Thibaut Pinot (FDJ) by just five seconds, five seconds that would leave the defending Giro champion off of the podium. Naturally, Nibali wasn't going to let that happen. As it turned out, despite the expressed statements of the eventual winner of the Giro, Tom Dumoulin, that both Nibali and Quintana would be off of the podium. Instead, it was Dumoulin on the top step, with Quintana holding his second place and Nibali defending his third place. At least the podium reception was cordial if not out right friendly. 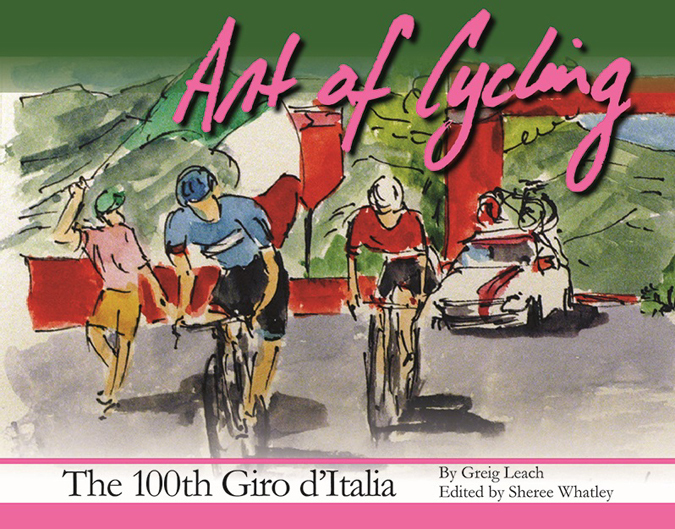 With the racing of the 100th Giro d'Italia, I am crowd funding my third cycling art book through Kickstarter. I could use your support in helping this book get made, please consider backing the project here: https://www.kickstarter.com/projects/1335072134/art-of-cycling-100th-giro-ditalia. This will be just one of the hundred plus paintings that will be included. With Kickstarter, if there is not a 100% funded, no one is charged a dime, and the project recieves 0% funding. 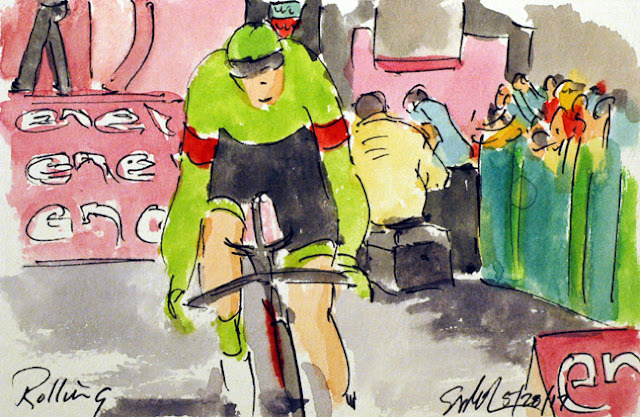 So this is the final painting of the 100th Giro d'Italia. I hope you have enjoy this electronic retelling of the story of the race. 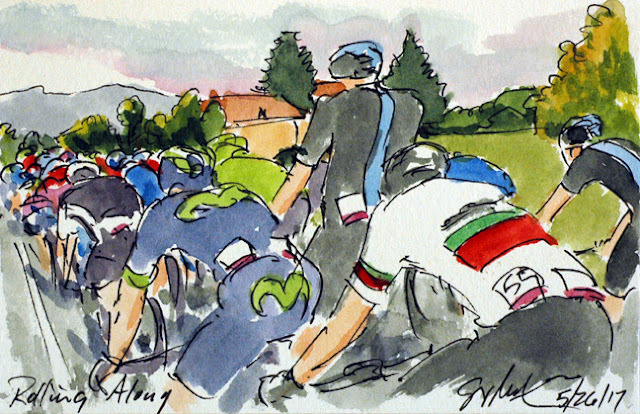 And that you will want to support my printed version of this most exciting of Grand Tours. So the total number of paintings of the racing came to 156 when all was told. Nairo Quintana (Movistar) was going to have the best time trial of his life if he wanted to keep his Maglia Rosa. While he did ride one of his best ever, it still wasn't enough to withstand the ride of Tom Dumoulin (Sunweb). Quintana had done his best to open up as big a gap as possible on the last road stage in hopes of doing enough to hold onto the pink today. I have enjoyed the racing in this Giro and found it interesting that the final stage was a time trial instead of a road stage. Normally, the final stage is a promenade with champagne toasts along the way winding up with a made sprint for the fastmen of the sport. 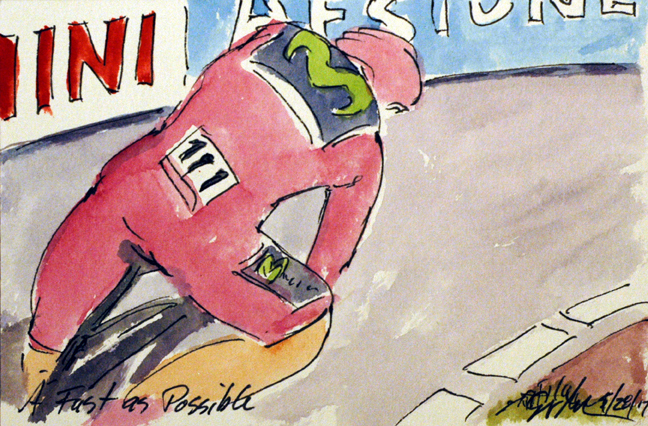 Instead, the Maglia Rosa and the Maglia Bianca wouldn't be decided until the last man crossed the line in Milan. It was widely expected, but that didn't make Tom Dumoulin's (Team Sunweb) ride any less exciting. The Dutch National Time Trial Champion knew he had to pull back 51 seconds on Nairo Quintana (Movistar) to claim the final Maglia Rosa. He could take comfort in knowing that he had first taken the jersey off of the shoulders of the Colombian in the first individual time trial. 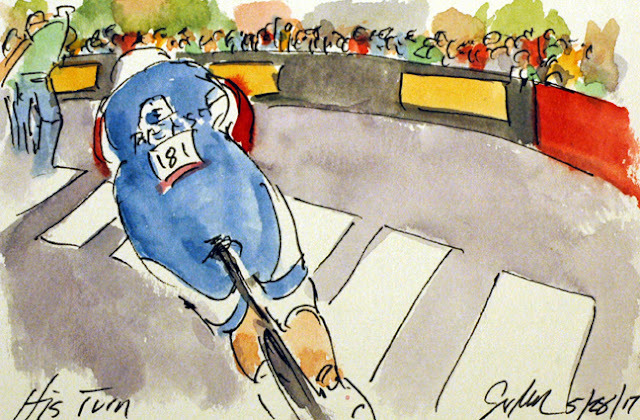 As he rounded this corner, he knew that he had already come two seconds to the good. So he also knew that he would be the first Dutchman to win a Grand Tour in decades. Chapeau, for a race well ridden! Tejay van Garderen (BMC) had neither the race, nor the time trials that he had hoped for in the Giro. He as able to get a stage win, which did quite a bit to ease the pain of the disappointment. BMC didn't exactly get what they were looking for either, it went wrong when their strongman Rohan Dennis was forced to abandon the race after a crash early on. I hadn't seen the crash, nor did I catch when he withdrew. I have been watching the race in Italian, a language I do not speak, so I have missed some of the details that occured off camera. The final stage of this Giro d'Italia began on the formula one race course in Milan. It seemed a fitting gesture as the time trial specialist would be zooming around the 29 kilometer of the individual time trial. I was taken with the rather clever paint job on the warning track of the raceway. Normally the markings are red and white, but I guess they couldn't resist the opportunity to fly the Italian flag (as it were). Andrey Amador (Movistar) use the same strength he has employed in the serivce of his captain to post a respectable time. Pierre Rolland (Cannondale-Drapac) rolled down the ramp on his way to a less than stellar individual time trial. He need not worry, he has raced a brilliant Giro that included a stage victory. I will admit that I am a fan of the Frenchman and have enjoyed his agressive racing. I imagine that today's performance was due partly to the aggression he has exhibited in the final week of the race. Jos Van Emden (LottoNL-Jumbo) had been flying well under my radar, in fact I don't think I have encounter him in a race ever before. He started the day 120 riders behind the Maglia Rosa of Nairo Quintana. He was also four hours and nearly twenty minutes behind the time of the race leader. But today, today he was posting the best time at each and every time check, including the most important, the final one. Now with a time trial, the rider with the best time will sit in the "hot seat" until someone comes along and betters his time. Van Emden would be waiting a long time for the masters of the discipline to start, let alone finish. At the end of the day, no one was able to take his seat away from him. Thibaut Pinot (FDJ) had finished in the top five on four previous stages, so he was beyond excited to win the final road stage of the Giro. Over his shoulder, Vincenzo Niblai (Bahrain-Merida) looked over to make sure he had place in the top three. 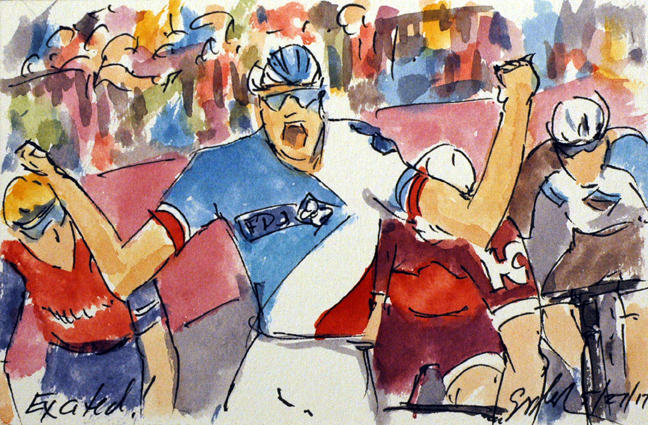 He needed the bonus seconds to offset the 10 seconds Pinot's stage win earned the Frenchman. Grabbing second on the stage was Ilnur Zakarin (Katusha-Alpecin) who had worked hard to keep himself and Pinot away from the chasing group the included, Nibali, Quintana and Pozzovivo. Rounding out the top five on the day, where Domenico Pozzovivo (Ag2r La Mondiale) and Nairo Quintana (Movistar). Sorry, Quintana, didn't make it into frame, but his ride moved him to a 53 second lead over Tom Dumoulin. Now Thibaut only trails Nibali by two seconds, leaving just 39 seconds separating first through third. Dumoulin has now dropped to fourth overall (remember Nibali's remarks about karma?) but is still well within striking distance of the win tomorrow and retaking the Maglia Rosa. If you are wondering, Jungels did not gain anytime on Adam Yates in the race for the Maglia Bianca. The duo of Tom Dumoulin (Sunweb) and Bob Jungels (Quickstep) had reason to work together in the cashing group. Both were hoping to reclaim their previous leaders' jerseys. For Dumoulin, his goal of the Maglia Rosa, was up the road on Nairo Quintana's shoulders. And for Jungels, his Maglia Bianca, was just behind him, watching his every move, on the shoulders of Adam Yates (Orica-Scott). Both of these guys have a reputation for being stronger at the individual time trial than those wearing their respective jerseys. So depending on the finish today, their will be a lot riding on the very specialized bikes of the time trial tomorrow. Once Vincenzo Nibali (Bahrain-Merida) had gone on the offensive, it forced everyone else to respond. Quickly joining the Italian was Thibaut Pinot (FDJ). His attack brought the Maglia Rosa of Nairo Quintana (Movistar) out of the gruppa to join the effort. Behind them, Tom Dumoulin (Sunweb) was struggling just a bit, so this trio was hoping to put as much time into the Dutchman as possible. Everyone was made aware of Dumoulin's time trialing prowess on stage 15, so none wanted to cede the race to him on the final stage tomorrow. Then of course their was a stage victory and podium positions to ride for today, as well. With the gaps so narrow and this the final climb of the race, it was certain that there would be attacks today. The first to go was the defending winner from 2016, Vincenzo Nibali (Bahrain-Merida). 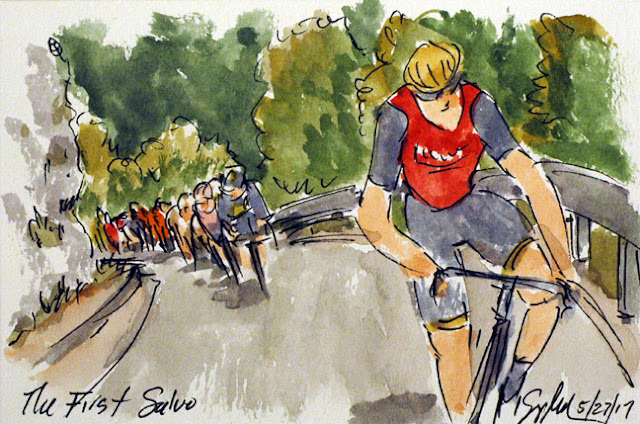 He is no stranger to last minute serges, having won the Maglia Rosa last year on the final stage. I am sure he was hoping to do that this year, or maybe even this stage. Behind him, the Movistar lead peloton felt confident that their man, Nairo Quintana, could bridge across if Nibali didn't just drift back on his own accord. Of course, they were looking to add time to their lead over the Italian and the former holder of the Maglia Rosa, Tom Dumoulin (Sunweb). 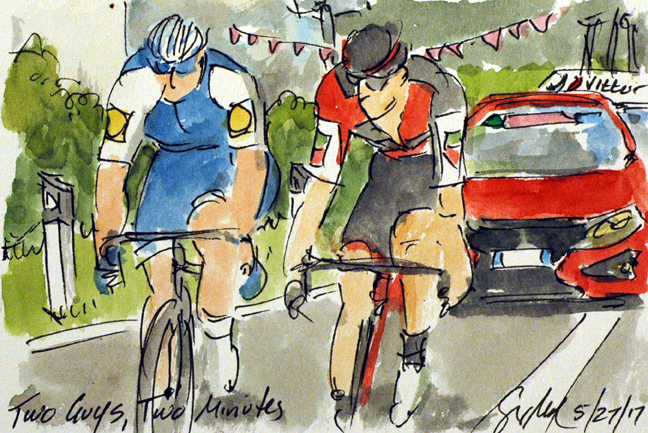 The last two members of the early break were, Dries Devenyns (Quickstep) and Dylan Teuns (BMC). 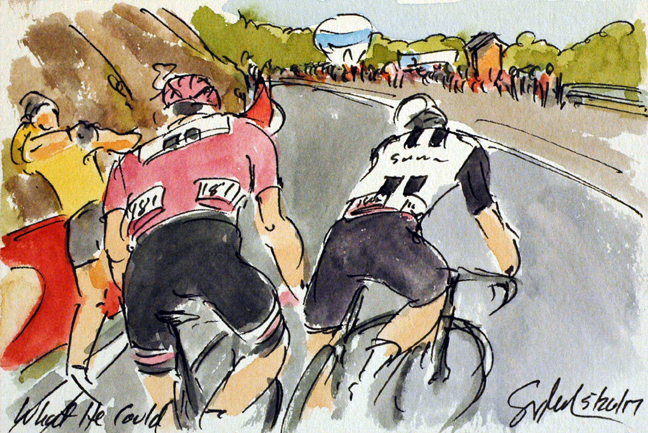 The pair had gotten to the valley floor between the last two climbs of the 100th Giro d'Italia with a two minute advantage over the gruppa maglia rosa. 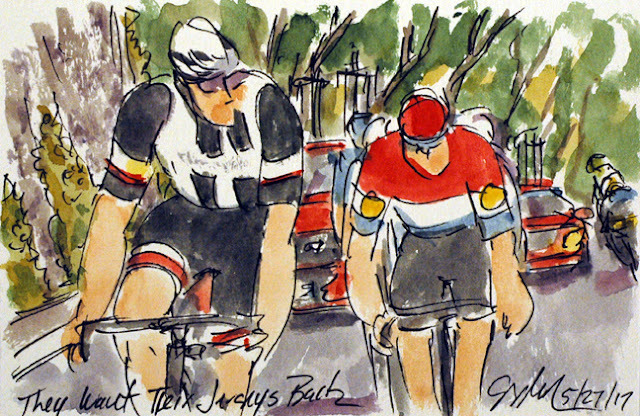 Devenyns may have been looking to help his teamate, Bob Jungels, regain the Maglia Bianca, but Teuns was on the front looking for stage glory for himself. I have enjoyed seeing all of the pink decorations along the course of each and every stage. Today it seemed to be the day for the pink pennants to festoon the yards along the roadside. 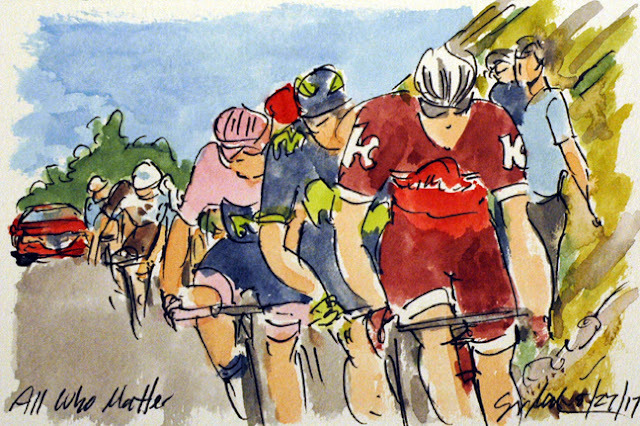 It may be their climbing domestiques who are on the front of the peloton, but it is all of the riders who figure in the overall general classification who are together as they scale the penultimate climb of this Giro. Starting the day with less than a minute between the top four places, no one could afford to be inattentive, or worse, have bad legs today. Nairo Quintana (Movistar) decked out in matching pink gloves, helmet and even sunglasses, kept a close eyes on all those behind him on GC and the road. While all of the hopefuls are here, it is only Domenico Pozzovivo (Ag2r La Mondiale) who you can see popping out from the group a few riders back. The final road stage, and this is the final break away of the 100th Giro d'Italia. The quintet of riders hit the base of the Monte Grappa with a few minutes in hand, but it could be argued that they were all out front to provide help to their respective team leaders later in the stage. The one member of the group you can't see is Dries Devenyns (Quickstep). 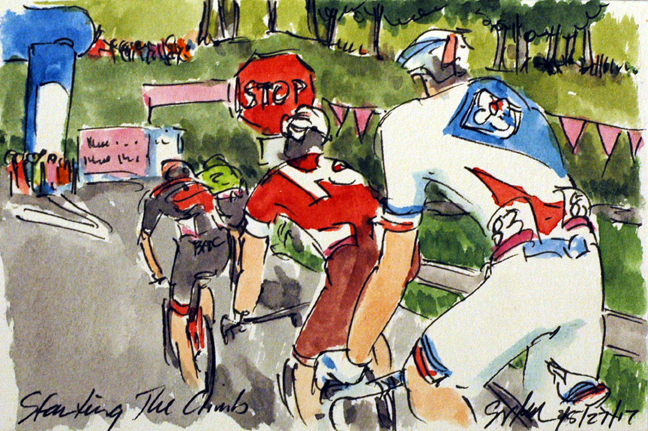 Otherwise, it is Tom Jelte Slagter (Cannondale-Drapac) who is leading Dylan Teuns (BMC), Maxim Belkov (Katusha-Alpecin) and Mathieu Ladagnous (FDJ) through the stop sign and on to the climb. 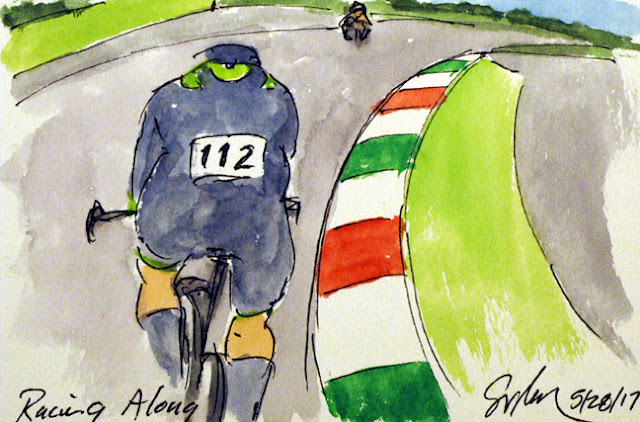 Giro, Stage 19: Where Are You? Some of the others taking advantage of the GC podium battle were, Ilnur Zakarin (Katusha-Alpecin) and Domenico Pozzovivo (Ag2r La Mondiale). 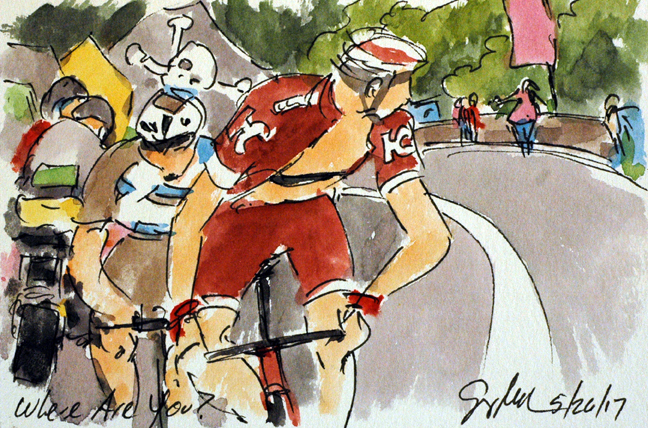 Zakarin was flicking his elbow trying to get Pozzovivo to come around and take a turn on the front. When he didn't come around, Zakarin looked behind, but couldn't find the little Italian, Behind the duo, you can see the Jolly Roger flag in memory of the beloved Italian cyclist, Marco Pantani. 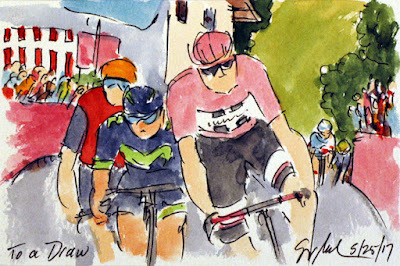 Down the road, the new favored Italian, Vincenzo Nibali and Nairo Quintana were racing for the Maglia Rosa. Somehow there was no imagery of the two crossing the line, with Quintana getting a couple of seconds on the Italian. 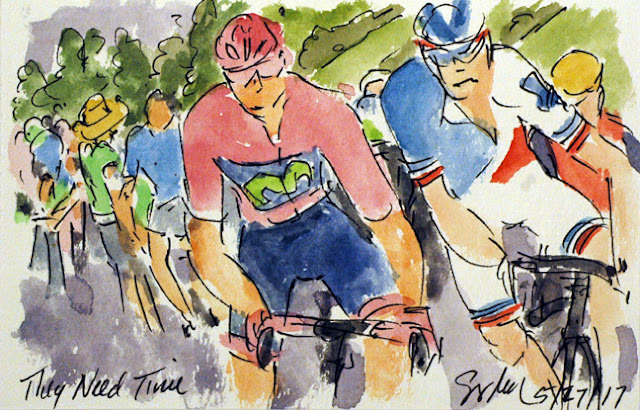 At the end of the day, the Maglia Rosa went to Quintana, Dumoulin moved to second and Nibali held his third place. His retort to Dumoulin is looking a little more prophetic. The commentators, the cameras, perhaps even the fans, barely noticed the brilliant solo victory by Mikel Landa (Sky). 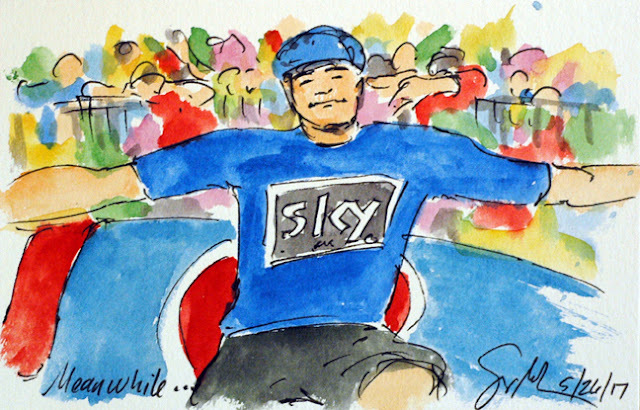 With his mountain top stage win, he has made the Maglia Azzurro his own. Like the Maglia Ciclamino, he just has to finish the next two stages to claim the final King of the Mountains title in Milan on Sunday. I guess everyone could be forgiven for paying more attention to the wide open general classification happen ten minutes down the road. 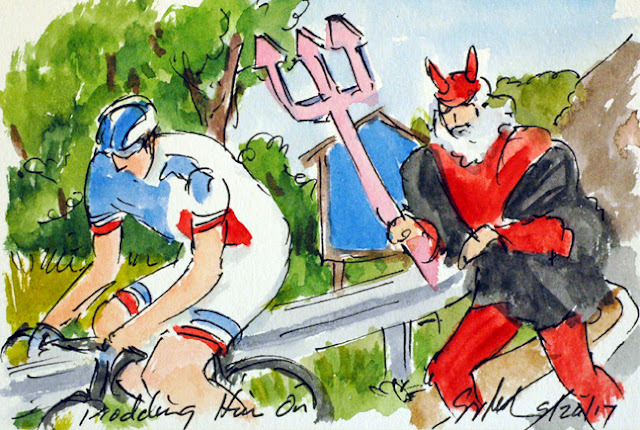 The Devil is a long time fixture of the mountain stages in the Tour de France, so it was a treat to find him along the roads in the Italian Dolomites. I have learned his name, but can't recall it right now. He has changed is Tour trident for a rather large pink foam version for the Giro. While he normally leaps surprisingly high in the air, today he ran along behind the Frenchman, Thibaut Pinot (FDJ). Pinot had jumped out of the favorites group knowing the Tom Dumoulin was losing seconds, perhaps minutes, behind. Pinot had used the indescision of the GC men to gain time yesterday and was hoping that he might be able to get onto the podium today. He got close, just eight seconds behind Vincenzo Nibali's (Bahrain-Merida) third place. At the end of today, less than a minute separated the top four places of the 100th Giro d'Italia. And there are only two more stages to go! Tom Dumoulin's (Sunweb) loyal teammate, Simon Geschke, had given all he had to give. He swung of the front and seemingly came to a complete stop. At this point there was still another seven kilometers of climbing to go. Dumoulin was already lagging those just behind him on the GC by 16 seconds. If he loses another 16 seconds he will lose his Maglia Rosa, surrendering it back to Nairo Quintana (Movistar) most likely. Although should Quintana suffer a similar fate, who knows who will be the next to don the coveted jersey. The Giro does finish with an individual time trial, the very discipline that allowed Dumoulin to take the jersey off of Quintana's shoulders to begin with. Since I paint these pieces in real time, I wasn't sure why Tom Dumoulin (Sunweb) was letting a small gap open between himself and his general classification rivals. 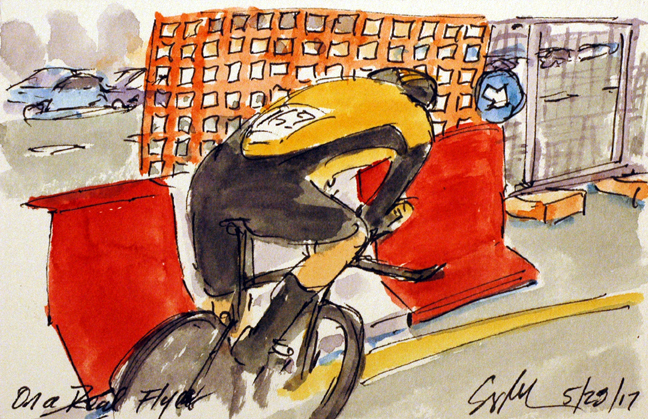 I was reminded of a Lance Armstrong ploy in the Tour de France. He mugged for the camera about how tired he was, and road at the back of the peloton. The news got to his rivals and they hit the front and road hard, burning teammates as they did. Later he attacked his diminished rivals and won the stage. Was Dumoulin doing a similar ploy? Given his words about he riding of Quintana and Nibali after yesterday's stage, I wouldn't put it past him. He does have his lieutenant, Simon Geschke, with him, so all may still be well. Gregor Muhlberger (Bora-Hansgrohe) was happy to have some motivate wheels to follow. No sooner had the break put Pierre Rolland (Cannondale-Drapac) back into its number than it was Luis Leon Sanchez (Astana) and Rudy Molard's (FDJ) turn to make a counter move. The duo went as they reached the 15 kilometers left to go banner. With a big climb ahead, and the peloton very far behind, it is highly likely that whoever gets away from the group will win the stage. 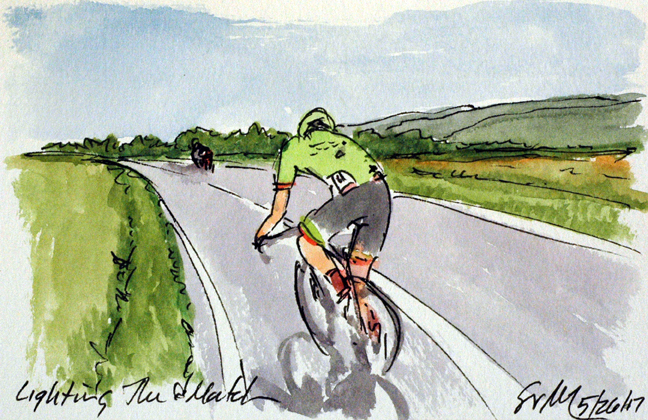 Once the chasing group of 11 joined the five up front, the break was just too much for Pierre Rolland (Cannondale-Drapac). He was the first to ride off the front before the final climb of the day. With 24 kilometers left to ride today, I am sure he was hoping for a little help. But you have to start some where. The base of the climb was only about twelve kilometers away, so soon there would be less an advantage in numbers. The peloton was disinterested in the break away up the road, so much so that they let the gap grow to 14 minutes. The peloton was riding at a speed that even I could have managed. Although for me I would have been riding flat out. For these guys, it was like a day off. At this point Philip Deignan (Sky) is riding with his hands off the bars at the back of the peloton. Both his teammate Michal Golas and Jose Costa (Bora-Hansgrohe) didn't seem remotely concern that he was sitting upright. I get very nervous on group rides when someone takes their hands off the bars, but then I don't ride with anyone that spends this much time on a bike, nor are their bikes as well cared for. Giro, Stage 18: Drinks for Everyone! Giro, Stage 15: Got Any Snacks? 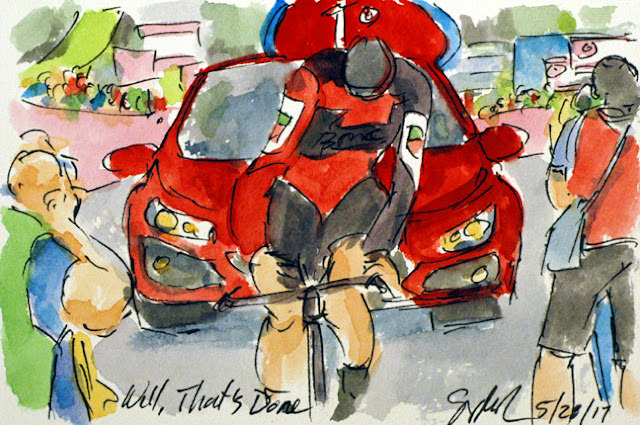 Giro, Stage 9: Work Together!